It's time to start talking about Autumn/Winter 2012 collections and I'm starting off with a goodie! Have a look at Trustafarian from Butter London. If I was to say to you that I was going to show you a green holographic polish, I'm pretty sure you'd probably bypass this post and on to the next one! But look at it. It's a soft sage green and in regular light, it just looks like it's really shimmery. But in the sunlight.... Oh it's gorgeous. It's a really sheer polish and you'll need three coats to get it to be this opaque but fear not, it dries really quickly. 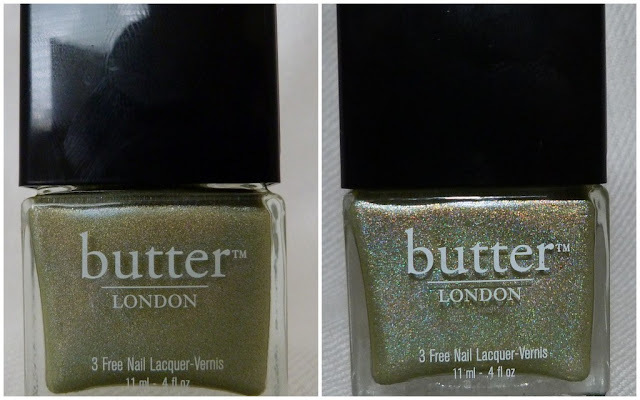 I'm not sure if that's a Butter London trait or just because the formulation is so thin. What I love about it is that indoors, it's a very muted shade and is really easy to wear at work without your coworkers thinking you're twelve. The only other holographic polish I've tried in the past is Gosh Holographic and that's a bit too much for me at work. Trustafarian is a more grown up, sophisticated holographic polish and is a nice departure from the usual dark nails we see in the autumn. 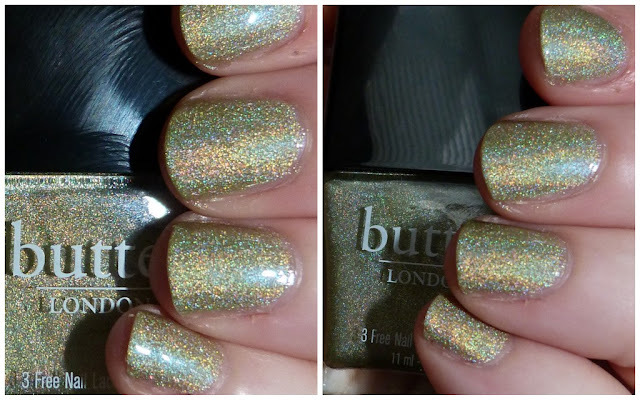 Trustafarian was sent to me from Beautymatters.ie and will be available for €15. We LOVE. This is on my wishlist ever since I first saw it, as much as I love polish I rarely go 15euro on one, but I think I may get this next time I have money to play with! Its sooooo purdy, But its gorgeous in the sunshine!!! !